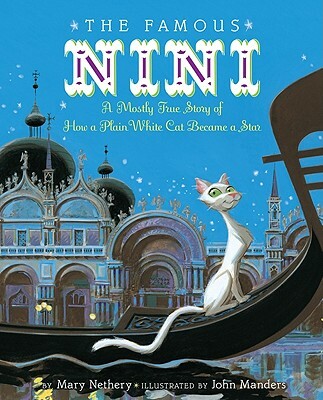 In Venice in the 1890s, a café owner takes in a stray cat she names Nini. This is against her better judgment, for the café is modest, and she has nothing to spare. But in no time at all, the cat becomes a celebrity, charming all sorts of important visitors, including Giuseppe Verdi and the pope himself. In the end, Nini’s resonant purr and the comfort it brings to a little girl produce a small miracle. Featuring humorous illustrations with a vintage feel, this inspiring story about a real cat assures us that acts of kindness can be rewarded in unexpected ways. Includes an author’s note. Mary Nethery is the co-author of Two Bobbies: A True Story of Hurricane Katrina, Friendship, and Survival and Nubs: The True Story of a Mutt, a Marine, and a Miracle. She lives in Eureka, California. You can visit her website at www.marynethery.com. JOHN MANDERS has illustrated more than a dozen award-winning books for children, including Humphrey, Albert, and the Flying Machine by Kathryn Lasky. He lives in Pittsburgh, Pennsylvania. You can visit his website at www.johnmanders.com.